How Should I Care for a Money Tree Plant? A Pachira aquatica, or money tree plant. The money tree plant, technically called Pachira aquatica or Malabar chestnut, gets its nickname from its use in feng shui as a money attractor. These plants are sensitive to overwatering and cold. Depending on how large they want their plants to grow, owners should carefully prune the plants. The most important thing about caring for this plant is to avoid overwatering it. Most sources recommend watering no more than once a week, and many advise watering from the bottom, as the braided trunks of the plant may rot if they stay too wet. As with other plants that do not require much water, it is best to let the soil dry out between watering. Adequate drainage is essential to keep the soil from remaining too damp. If the leaves turn yellow and begin to fall off, too much water might be the culprit. When kept indoors, money tree plants usually prefer indirect light, and will often do very well under fluorescent lights. Some direct sunlight will generally not harm them, but they should be kept from getting too hot. They should also not get too cold. Like most tropical plants, they have no tolerance for frost. Live plants are often used as "cures" in any of the feng shui areas, but the money tree plant is thought to be especially lucky. It is often placed in areas where money comes in: near a cash register in a business, for example. It might also be used in the work area of the feng shui bagua. In feng shui, the money tree plant is thought to be lucky because it has five leaves. The leaves represent the elements of feng shui: Wood, fire, water, earth, and metal. Plants that have more than five leaves are considered even luckier — A plant with seven leaves is considered to be the luckiest. Typically, the plants are sold in decorative containers and consist of three or four plants with their trunks braided together. 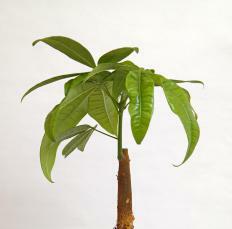 Money tree plants can be grown as full-sized trees or pruned into a bonsai form. A money tree plant could reach five feet (1.52 meters) or more in height if allowed to grow. In general, the larger the pot, the larger the plant will grow. If it is pruned as a bonsai, the money tree plant will remain small enough to live in a pot on a table. No matter what the size, a plant with a braided trunk must be pruned in order to maintain the braid as it grows; leaves can be removed, and the trunks gently trained into a braid. The plants become rootbound quickly, and should be repotted every few years. What is Good Feng Shui for the Bedroom? What are the Different Bonsai Supplies? What is a Bonsai Pot? What is the Best Soil for Bonsai? What is Chinese Lucky Money? I got a money tree for Mother Day, I live in south Texas. Where in my house can I keep it? @Rundocuri: While I don't have a money tree, I'm planning to get one because I think they have beautiful foliage. I have a lot of years of experience with various tropical plants, and also live in a climate with long, cold winters. I have found that as long as you bring them indoors before cool weather arrives, they continue to thrive throughout the winter season. I was curious if anyone knows if the money tree plant thrives indoors. I live in an area with cool winters, and I bring my potted plants indoors during this time of year.